So our app is now officially out there for 12 weeks and amazingly we have over 3,000 people using it at the moment to support them through their IVF cycle. Its interesting for me that I spent 8 years helping over 2,000 couples to have their dream of becoming parents and in 12 weeks with an app I can help over 3,000 women through their IVF cycle and not actually be there with them. On a daily basis I can work with so many different types of cases while in clinic, from trying naturally for a baby, to supporting a couple experiencing recurrent miscarriage to those who have decided to get assisted help in supporting them to get pregnant. In one room, a lady who has just found out she is pregnant, in the other room, where her life has been ripped apart as she deals with another unexplained month of infertility or another miscarriage within the 12 weeks of the 1st trimester. Over the last few months I have noticed something wonderful. Its going to sound weird, but mental emotional wellbeing is now trendy. No longer is it hidden in the homes of for me anyway, couples trying for a baby. Just feeling so alone….. Where no one understands what your going through. Maybe its down to Prince Harry talking about his grief, his sadness his disconnect to society or the 6 million users of the Headspace app. But something is changing…..
For the last 8 years, stress was not seen as an issue with fertility. Doctors truly did not believe that stress could effect a couple trying for a baby. The common answer was, sure, in war zones women get pregnant all the time…. And for a long time, I was afraid to put my hand up and say outlaid….. YOU IDIOT……. They are doctors they know best….. But slowly over time I realised that they were wrong…. So wrong…… and yes women do get pregnant in war zones…. But that is so different from infertility…. Its the same where you see a woman dosed up on heroine pregnant and go ‘REALLY !!!!!!!! !’ Or the person smoking while pregnant….. The thing is they are pregnant….. the thing is, you are not…… So more and more I moved into the space that stress is not going to stop you from getting pregnant….. I know that now…. BUT it is NOT helping the situation…… that excess cortisol in your blood stream is not helping…. You belief system of feeling like a failure is not helping….. and all those women around you that are pregnant and complaining about being pregnant are not helping you…. The woman in the war zone does not have a fertility imbalance….. she’s in a blood war zone…. My patients do have fertility imbalance, thats why they are not getting pregnant, now add on top of that stress, anxiety and a lack of hope and we are now in a really bad space…. 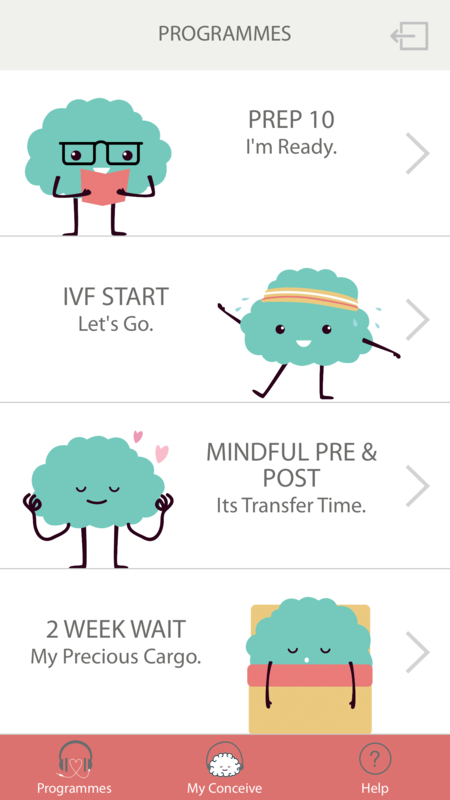 Mindful IVF is ‘ME’ in your phone, in your ‘HEAD’ and using all the knowledge and experience I have squashed into 10 minutes a day…. By no way is it perfect…. But I promise we are getting close……. Mindful IVF is there to bring you back to the person you are, reduce the stress of infertility and doing IVF and putting you back in control of your IVF. I’m doing this long enough to know that stress is going to impact a couple doing IVF…. I know right here, right now, stand up, jumping in the air, shouting at you…. STRESS EFFECTS IVF SUCCESS, and I shout ever LOUDER……. This app will help you in ways you can’t imagine….. So give it a try…. Whats the worst thing that could happen…….. and imagine if Im right……..